Sunrooms allow you to bring the outdoors in. Because they have solid roofing systems and glass walls, you’ll get to enjoy beautiful views and natural light all year long. Never will pesky no-see-ums, intense UV rays, or a sudden rainstorm ruin your outdoor time. And, depending on the model you choose, you may enjoy advanced features, such as thermal glass that will help maintain comfortable temperatures throughout every season. Because your sunroom will be completely enclosed, there’s no limit to what it can be used for. 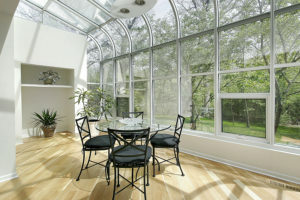 In fact, adding a sunroom is like expanding the living space of your home. Not only can you use the space to enjoy time with family and friends or relax after a long day, but you can also turn your sunroom into a gym or home office – all while enjoying beautiful outdoor views. To ensure you receive the best value for your investment in a sunroom, turn to the experts at Porch Outfitters. We are outdoor living specialists who have earned an outstanding reputation for quality workmanship since 1987. And, we install sunrooms from TEMO which will provide a lifetime of exceptional performance on your Hilton Head, SC, property.